Pasta carbonara, pizza Margherita, and a fresh panzanella salad. I love classic Italian dishes, but sometimes I like to experiment. I had to make a vegetarian dish for a dinner with friends, so I thought it would be a perfect opportunity to take a new look at lasagna, traditionally interweaving layers of pasta, ricotta, ragù, béchamel, and Parmigiano-Reggiano. But let’s take a step back. Many of you might be remembering that dire lasagna from church potlucks – soggy pasta and waterlogged ground beef. I recall separating the pasta and pulling out clumps of tacky ricotta, while trying to remove the cracked fluted edges of noodle from the top layer. Please, try not to associate frozen lasagna with a freshly made version – it’s not even comparable. The key to this lasagna is the pasta, which lends a wonderful texture and coarseness to the dish. Its chewy, dense consistency reminds me of traditional Italian pastas, perfectly al dente with a slight bite. What I love about this dish is it’s combination textures from creamy ricotta, silky butternut squash, and an earthiness from the crimini mushrooms. The luscious combination of ingredients can stand up to one another, and among all the flavors I can still pick out subtle hints of nutty parmesan. This recipe is inspired by one I found in an old copy of Bon Appétit. Melt butter into a large skillet over medium-high heat. I recommend using a skillet with high sides so you can use one pan for all your steps – heads up you’ll need to simmer your squash and noodles in vegetable broth so pick a larger pan than you might think. Add onions and sauté until soft, about 8 minutes and season with salt and pepper. Add garlic and sauté for another 1-2 minutes. Increase heat to high; add mushrooms and cook until tender, stirring constantly, about 5 minutes. Season with salt and pepper and then transfer the mushroom mixture to a bowl and set aside until you’re ready to assemble the pasta. In the same skillet, add squash, broth, 3 tablespoons thyme, and 3 tablespoons sage. Cover and simmer over medium heat until squash is just tender, about 6 minutes. Uncover and cook until squash is very soft but still retains shape, about 5 minutes. Season with salt and pepper. Skim the squash from the skillet and set aside. Don’t worry if it starts to fall apart a little, and discard the thyme and sage. Keep any vegetable broth left over in the pan. Add 4 cups of water to the broth and bring to a low boil for your pasta sheets. While your broth comes to a boil, mix ricotta, 2 cups mozzarella cheese, 1 1/2 cups Parmesan cheese, spring onion, and remaining 1 tablespoon thyme and 1 tablespoon sage in large bowl. Mix in eggs and season to taste with salt and pepper. Once your broth is at a low boil, place pasta in broth and let simmer for 3 min. Once slightly softened, you can turn off the heat and begin to assemble your lasagna. Brush 13x9x2-inch glass or ceramic baking dish with oil. Spread 1 cup ricotta mixture over bottom. Arrange 3 – 4 noodles on top (I usually cut a few so I can cover the entire dish). Spread 13/4 cups ricotta mixture over noodles. Arrange 1 1/3 cups squash mixture over. Sprinkle with 1/2 cup mushrooms and 1 cup mozzarella. Top with 3 noodles, then 1 3/4 cups ricotta mixture, half of remaining squash, 1/2 cup mushrooms, and remaining 1 cup mozzarella. 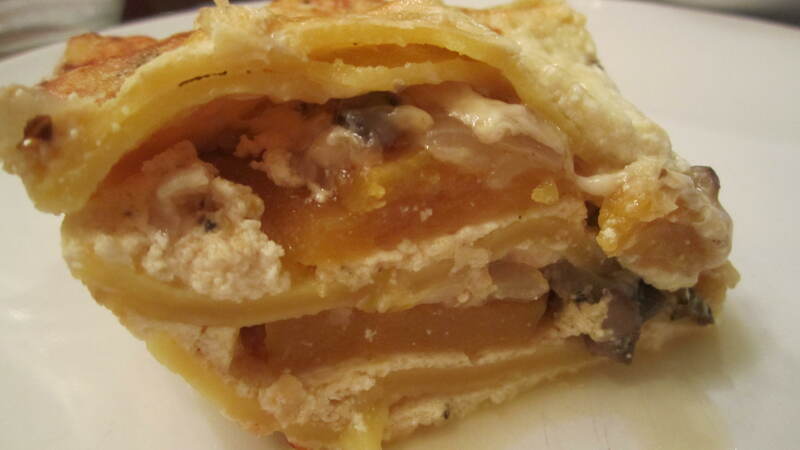 Repeat with noodles, 1 3/4 cups ricotta mixture, remaining squash, and remaining mushrooms. Top with 3 noodles. Spread remaining ricotta mixture over; sprinkle with remaining Parmesan. Preheat oven to 350°F. Bake lasagna, covered, 35 minutes. Uncover; bake until heated through, about 25 minutes longer. Serve with a fresh arugula salad! I can’t bring myself to buy jarred pasta sauce when it takes less than 10 minutes to make it from scratch. It just doesn’t compare to the bright flavors of freshly made pasta sauce – and it’s not just better tasting it also better for you. The simplest, and most authentic marinara is a quick sauce, seasoned only with onion, garlic, pepper, and, if you like, basil or oregano. The pieces of tomato are left chunky, and the texture of the finished sauce is fairly loose. It’s that easy. Toss with your favorite pasta and you’re weeknight meal is a quick trip to Italy! Once you have this base, with just a few adjustments, you can make a range of sauces from a few simple ingredients. Today we’re making Capellini with arrabiata sauce. This dish’s name – arrabbiata – comes from the Italian word for “angry” because of the spicy tomato and red pepper. The sweet tomatoes balance the heat from the peppers and will awaken any palate. The salty, charred flavor from the grilled chicken offsets the heat and adds an element of texture to this luscious bowl of pasta. No need for take out tonight, make a large bowl of pasta for your family and I promise you’ll go to bed with full bellies and a full wallet. 1 can diced tomatoes, 8 oz. 2 cans stewed tomatoes, 16 oz. Place large pot of water on stove to boil for the pasta. Once it boils lower it to a simmer until everything else is ready. The pasta only takes 4 minutes to cook so it’s the last thing you want to do, but you want to have the water ready to go. Place skillet on medium heat and add olive oil. Saute onion, garlic, salt and pepper for about 5 minutes. You want the onions to turn opaque; you don’t want them to brown. Add diced tomatoes, stewed tomatoes and tomato paste. Stir in Italian seasoning and red-hot chili peppers and return to a low simmer. Carefully spoon out about half the mixture and place it in a food processor. You can also use a blender but be careful and hold the lid down tightly since the heat will want to push it up. Blend half the sauce and add it back into the skillet. This will add richness to the sauce while still keeping some texture. Add Parmigiano-Reggiano and lower heat to low. Now it’s chicken time! Spray hot grill with PAM and place chicken over direct heat. Close lid and cook for approx. 6 minutes, then flip and cook another 6 minutes with the lid closed. Chicken’s done at 165 deg. There is no rare or med rare for chicken. You have to cook it done every time! Try not to prick the breast much, it will make the juices run out and cause it to be dry. Remove chicken from grill and let it rest while you cook the pasta. Don’t slice immediately; wait until you’re ready to serve. Return water to a boil, salt water (1 tbsp. salt) and add pasta. Stir well and let boil for 4 minutes. Start the 4 minutes as soon as you drop in the pasta. While pasta cooks, add parsley and basil to the sauce. Drain well and reserve a cup of pasta water to add to the sauce. This thin pasta is very delicate and will turn to mush if you over cook it. Add drained pasta directly into sauce and stir. Add some of the pasta water if needed; it will help loosen the sauce if it gets too thick. 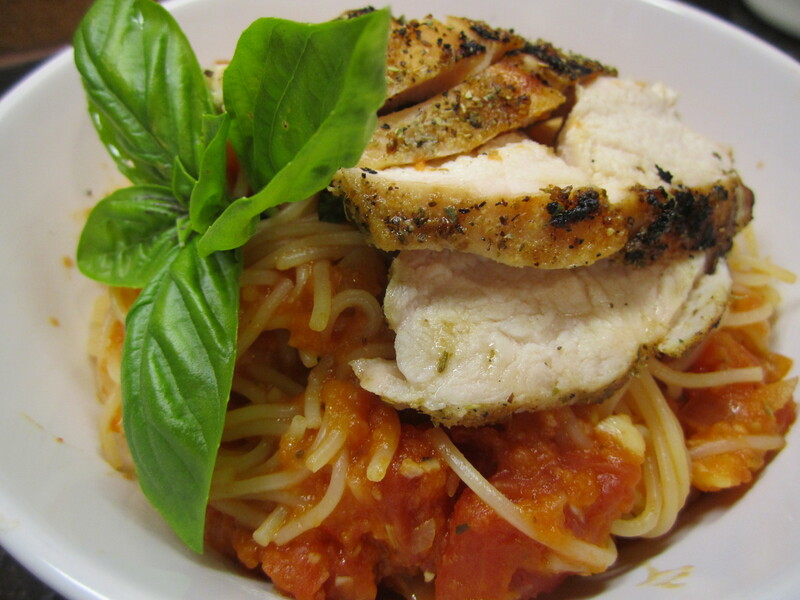 Fill a large bowl with a healthy serving of pasta and top with sliced chicken breast. Wait for it…. go! I dash for the sink where I scoop up a big clump of freshly cooked pasta and try to navigate it into my mouth before I got caught. I guess my Italian heritage runs strong, as I’ve always had a strong love for pasta. In fact, you might call it an addiction. No matter what time of year, pasta always has a place on my menu. I remember my mum cooking her homemade spaghetti and the smell of fresh garlic and leeks throughout the house, no matter how much I try to replicate it never seems to come out the same. During the summers, I would load up on pasta carbonara the night before a big swim meet, hoping the pasta gods would help me pop my time and qualify for the county swim meet. While the ratio of sauce to pasta has changed over the years, the aroma and flavor of a warm bowl of pasta will always be the same. I’ll eventually share all my favorite pasta dishes, but the one I have today is something you can whip up on the busiest of nights, and I promise you wont go to bed hungry. If you’ve ever picked up a container of bright cherry and pear-shaped yellow tomatoes and couldn’t resist buying 2 or 3 cartons, then this recipe’s for you. Their sweet, crisp flavor breathes summer, and they’re the main ingredient in pasta ponza. Part of the attraction of this recipe is its adorable name. 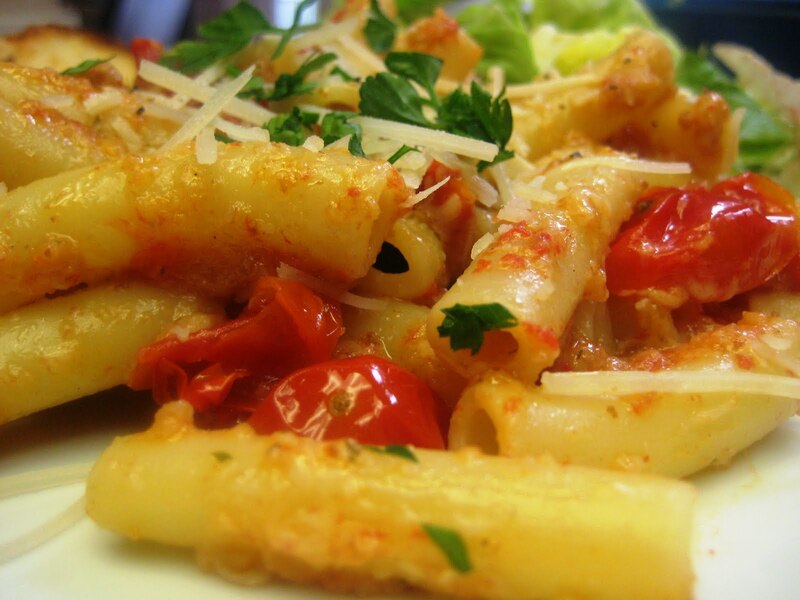 Wouldn’t it make you smile to say (even to yourself) that you’re going home to make ‘pasta ponza’ for dinner? The sauce gets most of its flavor from combining several varieties of tomatoes. The recipe suggests half red cherry and half yellow cherry tomatoes, but you could use any combination you’d like. The sauce is so simple, you start by placing the tomatoes and capers in a baking dish, drizzling them with olive oil, sprinkling them with seasoned bread crumbs and roasting the mixture in the oven for about 30 minutes. Done, that’s it! I know, could this be any easier?!? When it’s ready, the breadcrumbs will be golden-brown and crunchy, and the tomatoes will be slightly broken down, juicy and very intense. Once added to the pasta, the salty bite of the Pecorino-Romano really brings out the sweetness of the tomatoes, and the breadcrumb topping coats each piece of pasta with mild Italian herbs and creamy cheese. This is a staple in my busy workweek, and it’s just as good the next day for lunch. Quick tip: when you reheat it the following day, add a splash of water to the bowl to get the sauce back to its creamy consistency. This recipe is inspired by Giada De Laurentiis, and of course I tweaked it to make it my own, and I encourage you to do the same. If you need to make this pasta more appealing to a meat-loving loved one, feel free to add grilled chicken, Italian sausage or crumbled bacon. Preheat the oven to 375 degrees F. Butter an 8 by 8-inch glass baking dish. Place the tomatoes, capers, 1 tablespoon olive oil, 1/2 teaspoon salt, and 1/4 teaspoon pepper in the prepared baking dish. Toss to coat. Sprinkle the breadcrumbs over the tomato mixture. Drizzle the top with olive oil and bake for 30 to 35 minutes until the top is golden. Bring a large pot of salted water to a boil over high heat (add the salt after it’s boiling so it flavors the pasta… go, on, throw in a small handful, do it!). Add the pasta and cook until tender but still firm to the bite, about 8 to 10 minutes. Drain and reserve about 1 cup of the pasta water to add later when creating the sauce. Place the pasta in a large serving bowl. Spoon the tomato mixture on the pasta. Add the cheese and toss well. Add a little of the pasta water to help create a sauce, it helps the cheese melt and coat the pasta tubes. Sprinkle with the chopped basil and more cheese and serve immediately.